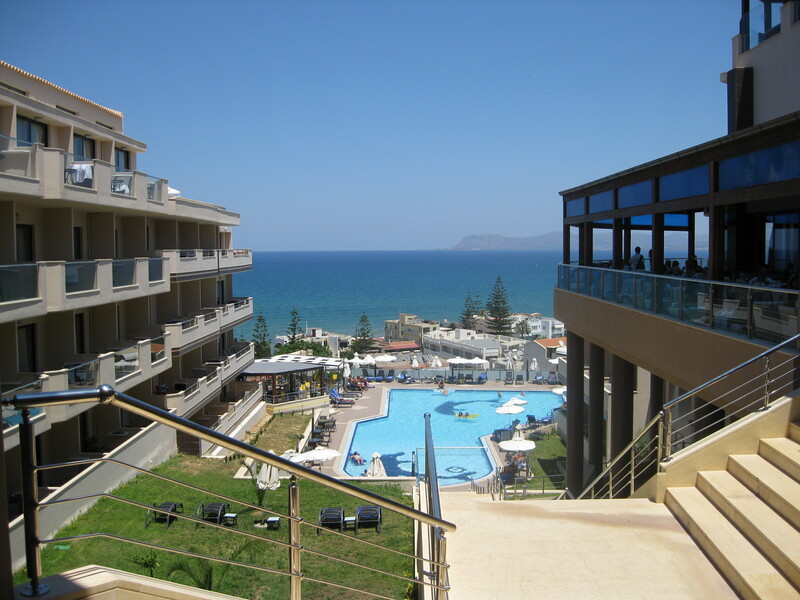 The Galini Sea View is one of a number of large, modern hotels which have invaded the landscape around Aghia Marina. In manner vaguely reminiscent of Club Med, it offers every possible enticement to enjoy Crete from within its pale yellow stone walls. There’s no need to leave the Galini for anything really. There are two bars, one in the lobby (ideal for quiet people watching) and a poolside establishment, with a laidback daytime atmosphere and lots of lively and involving evening activities, like quiz contests. There is a shop, with great souvenirs and all necessities, a library with books in a variety of language and a business centre (in case you can’t let go of it al)l.
There is a gym, of course, and two pools – one indoor and one outdoor. The outdoor pool is surrounded bya lawn covered in deckchairs which never seem to be vacant, at least not in daylight hours. A group of enthusiastic young animateurs from Eastern Europe rouse the occupants at regular intervals for aquatic activities but they never fully vacate. There’s always some mark of ownership left behind! If you do feel like a dip in the sea, it’s a short stroll down the hill, across the road and down an alley past the Galini Beachside hotel. This Galini is an older, smaller, humbler Galini but it has a pool, a restaurant and a bar and moreover, it has a charm that its big sister up on the hill does not. Besides, it’s closer to the sea. Out in front on the sand, dozens of deck-chairs and sun umbrellas are lined up, but like those at the pool, these are fully occupied in daylight hours. Luckily, just nearby, an enterprising gentleman has his own deckchair domain, (albeit without umbrellas, but then who comes to Crete for the shade?) and for the cost of a couple of euros you can recline from sunrise to sunset and beyond. Our seven days at the Galini were really most enjoyable. I took full advantage of the Cretan section of the buffet at the Grand Blue. I didn’t swim in the pool or darken the doors of the gym, but the hike down and up the hill the long swims in the Aegean were workout enough. I didn’t once stretch out on the Galini’s deckchairs, either pool or beach side, nor did I take shelter under its umbrellas, but I benefitted fully from the Cretan sun and added a few euros to local small business. We dipped into a quiz night (but were defeated by a family of Brits) and enjoyed a night of Cretan dancing with the animateurs. I loved our cool, airy comfortable room with its sumptuous bathroom and its balcony with a glimpse of the sea. All in all the Galini was a good base from which to explore and discover Crete.